My flatmate and I decided to treat ourselves to an itison voucher for afternoon tea with prosecco voucher at Patisserie Maxime. And boy does this place put on a nice looking afternoon tea! First of all let's talk about the presentation. I don't think I've seen such an elaborate cake stand in my life. Three tiers of planks of wood held together like a tree, topped with (fake) grass! It was certainly unique and really made it stand out. In terms of the savouries they were for the most part okay, but nothing absolutely amazing or stand-out. There were the classic sandwich toppings of egg mayo and ham, cheese and pickle on a more French-style bread. There was also an omelette on a crunchy, crouton-like bread which was quite nice. The salmon and avocado mousse was pretty disappointing as it sounded right up my street, but in the end it had very little flavour. Now for the best bit... the cakes and pastries! We had one full-sized fruit scone each which was a nice surprise as afternoon teas tend to provide you with those mini scones and it just leaves you wanting a real one. The scone itself was nice but sadly was only accompanied by butter and jam... who doesn't want clotted cream on their scone especially in an afternoon tea setting. The middle tier was probably the best one. There were two pastries each a chocolate twist and a cranberry twist (which was quite unique and very delicious), there was a fruity mousse which I could give or take, a pistachio chou and a macaron each. I was a little disappointed that neither macaron had a particular taste/flavour. The top tier included a mini raspberry tart which was delicious and a little pistachio cake. Overall my favourites were the pastries and the raspberry tart. 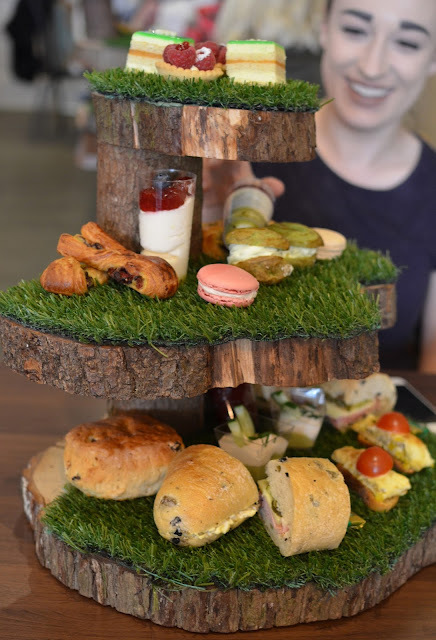 I wasn't particularly blown away by the food but the whole look of the Afternoon Tea was impressive and it would make for a great treat for a mother or grandmother. The prosecco was really decent and you get your usual tea (or coffee) as well. Considering we got a great deal, I wasn't at all disappointed as you get so much food and it's really good value. Check out their website for yourself here.